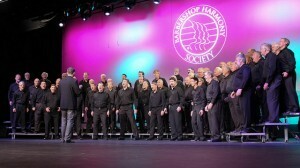 The Vocal Majority men's chorus of Dallas reclaimed the gold medals that eluded them last year, as they captured the 2018 international championship of the Barbershop Harmony Society on Friday, July 6 in Orlando. The tender ballad “What I Did For Love” from A Chorus Line and “Don’t Rain On My Parade” from Funny Girl with extravagant choreography propelled the 153 -man chorus to its 13th world championship, the most ever in barbershop competition. It was a return to form for the Dallas dynasty, outpacing second place rivals Westminster Chorus by a comfortable 1.5% margin. It was the first faceoff between the two powerhouses since 2010, when Westminster beat the Vocal Majority.